Set between the Pacific ocean and the Oaxacan jungle in Mexico lives a local community who have dedicated their lives to protecting and conserving local wildlife. I had the privilege of living and working alongside these people in the summer of 2017. I had applied for a Mexico Explorer award with EIL Intercultural Learning Ireland, an Irish non-profit that provides people with opportunities to travel abroad and study or work with local communities. As part of the Mexico Explorer award, I had the opportunity to study Spanish in Oaxaca city for two weeks in order to prepare myself for living in the remote area of Santa María Tonameca. 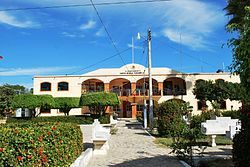 In June I arrived in the village of La Ventanilla, which has developed and prospered as a sustainable community over the last 20 years. 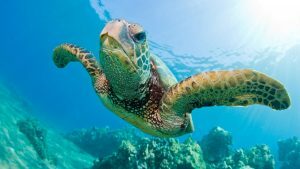 In the past, families used turtle trade as a source of income, but in May 1990 the President of Mexico, Carlos Salinas de Gortari, declared a permanent ban on the trade and capture of sea turtles and turtle eggs. Mexico is the home to seven of the world’s eight species of turtle, including Loggerheads, Pacific turtles, Atlantic turtles, and Hawkbills. The turtles migrate along the Pacific coast and come ashore to lay their eggs on the beach, so La Ventanilla is covered in turtle tracks every summer. The number of turtles has significantly depleted since the last century, mainly due to human activities – from the fishing industry with their massive trawlers, to sea pollution and poaching. In order to combat this, local men used their tracking and poaching skills to locate the turtle eggs and establish a safer area for them to hatch. The guides’ homes were situated right in front of a lagoon and an undeveloped beach which stretched for miles, reaching nearly as far as the famous surf spot of Puerto Escondido. Between 11PM and 4AM the guides leave their families to walk and scout the beach for any signs of turtle tracks, and to reach the eggs before the poachers do. As you walk up the beach, the right hand side has a lagoon full of crocodiles; on the left are the powerful waves of the Pacific ocean which have unpredictable tides that can cut a person off from the mainland without warning and drag them out to sea. On route the trackers keep an eye out for poachers from other towns and cities whom, they explained to me, are a lot more aggressive than the local poachers. On my first night I accompanied a guide on such an excursion, we left our cabins at approximately 1AM and made our way down to the beach. On my right, I saw the glowing eyes of crocodiles and human tracks of poachers on the sand. The poachers tracked the eggs before we did. We made a decision to leave earlier in future in order to reach the eggs before the poachers did and before the tide washed away the prints made by the turtles. This new approach worked during further excursions – we followed fresh turtle tracks and located turtle eggs buried deep in the sand. These were carefully prised out each time and reburied in a closer location to the village or in sand buckets which the guides monitored. I had the privilege of watching baby turtles hatch from these sand buckets, and be released in their hundreds. The guides were young men with families who had been small children when the ban came into effect and witnessed the shift in attitudes of their local community towards sustainable development and conservation. The older men who had caught and sold the turtles and their eggs before the ban taught the current guides everything they knew about hunting and location these animals. Many from the turtle hunting era have since passed away, but their knowledge and skills haven’t died out. The community also focused heavily on the protection and conservation of flora and fauna. An animal conservation site was established on a small island surrounded by a lagoon in the village. Here, tourists are brought on tours in boats hand-paddled by their guides. Mexican veterinary students would assist for a few weeks during the summer with the animals. On the island, locals are busy building new animal pens for rescued animals and monitoring newborn baby crocodiles and deer. One section of the island was dedicated to the replanting of Mangrove trees, which I spent several weeks helping to prepare for the following Autumn. The overseer of the mangroves explained to me that a massive storm destroyed a section of the mangrove forest and they had spent the last two years gathering seeds and replanting the trees by hand in the lagoon – backbreaking and dangerous work, as these lagoons are full of crocodiles. 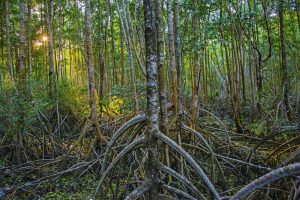 The mangroves are essential for animal habitat, shade from the sun and protection from the powerful Pacific Ocean, which I could hear crashing on the shore a distance away. On the mainland, many families send their children to college where they study marine biology, biology, or sustainable development in order to assist and develop their community further. Not only was the environment physically demanding, but mentally and socially also. It was predominantly men who took care of the animals and attended college courses: as a woman, I had to push more to be allowed to work on the island and with the guides. Upon my return to Ireland, I have had time to reflect on what I experienced during those six weeks in Oaxaca and how Ireland has the potential to develop sustainable facilities. Encouraging sustainable living tourism and implementing more eco-based appliances in public buildings would be an excellent start. Intercultural exchange is undoubtedly a valuable experience for Irish people: it gives us a chance to witness events that would never occur in our home country; establish friendships and bonds with people from diverse cultures; and open our eyes to issues in the world that need to be addressed – as well as providing us with the knowledge to help us change our own home for the better.